Sci-fi action produced and co-written by James Cameron and directed and also co-written by Robert Rodriguez. The story is set several centuries in a dystopian future and follows the abandoned cyborg, Alita (Rosa Salazar), who is found in the scrapyard of Iron City by Dr. Dyson Ido (Christoph Waltz), a compassionate cyber-doctor who takes the unconscious cyborg Alita to his clinic. When Alita awakens she has no memory of who she is, nor does she have any recognition of the world she finds herself in. Everything is new to Alita, every experience a first. As she learns to navigate her new life and the treacherous streets of Iron City, Ido tries to shield Alita from her mysterious past while her street-smart new friend, Hugo (Keean Johnson), offers instead to help trigger her memories. A growing affection develops between the two until deadly forces come after Alita and threaten her newfound relationships. It is then that Alita discovers she has extraordinary fighting abilities that could be used to save the friends and family she’s grown to love. Determined to uncover the truth behind her origin, Alita sets out on a journey that will lead her to take on the injustices of this dark, corrupt world, and discover that one young woman can change the world in which she lives. Alita: I don’t mean to be rude, but am I supposed to know you? Dr. Dyson Ido: Actually, we haven’t met. I’m Dr. Dyson Ido. This is Nurse Gerhad. Alita: Do you know who I am? Dr. Dyson Ido: Well, we were hoping you’d fill in that part. Since you’re a total replacement cyborg, and most of your cyber body was destroyed. We can’t find any records, but your very human brain is miraculously intact. Theoretically you should remember something. Alita: Oh, well, it’s still pretty blank. No, it’s completely blank, actually. I don’t even know my own name. Dr. Dyson Ido: Let’s look at the bright side. Your tears are working. Hugo: I got to admit, I never saw anybody challenged the Centurion before. Hugo: Oh, you’re a cyborg? Sorry, I was just admiring your hand. Can I see? Hugo: Wow. It’s really nice work. Did Dr. Ido do it? Alita: He built all of me. Except my core. That’s mine. Hugo: Oh. He did a really great job. Alita: Hey, where are those things? Hugo: What planet are you from? Alita: Ido found me in the scrapyard. Hugo: Hi, Doc. I got those drive boards you were looking for. Dr. Dyson Ido: Alita is new in here. She’s still learning about things. Chiren: Who is the girl? Dr. Dyson Ido: My new assistant. Chiren: I was surprised to see her in our daughter’s body. You were supposed to have destroyed that years ago. Dr. Dyson Ido: I couldn’t. Chiren: Clearly. And did you tell her who you built that body for? Dr. Dyson Ido: Our daughter is dead, Chiren. You need to let it go. Chiren: Oh, it’s obviously not me that’s clinging to something here. Dr. Dyson Ido: Didn’t I tell you to be home before dark? Alita: What’s the big deal? I just lost track of time. Dr. Dyson Ido: Don’t trust anyone. People do terrible things to each other here. 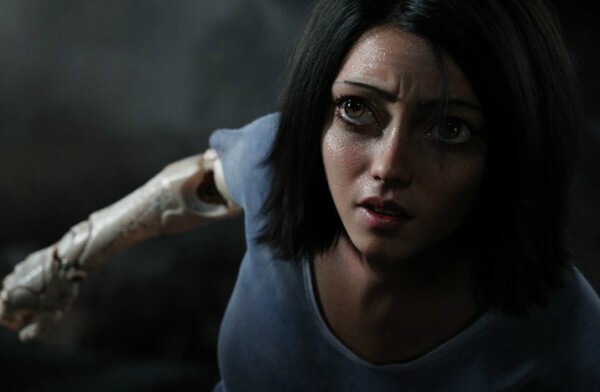 Alita: What happened to your arm? Dr. Dyson Ido: You still need a proper nourishment for your brain. Alita: Do you have any chocolate? Hugo: It’s a harsh world. The strong prey on the weak down here. You got to stay focused on your dream. Hugo: The tubes are just for cargo, not for the people. If I were as strong as you, I’d climb that tube to Zalem right now. Alita: They don’t let anybody up there. Hugo: No, that’s what they want you to think. You just got to know the right people. I happen to be connected. Hugo: You got to willing to do what it takes. Whatever it takes. Funny thing is you’ve seen it. You just can’t remember. Alita: What do you mean? Hugo: Doc found you in the scrapyard. All that stuff is dumped from Zalem. So you must be from up there. Hugo: If you could just tell me what those eyes have seen. Alita: I wish I could. I keep trying to remember, but it’s still a blank. I’m starting to feel like I wasn’t very important. Just an insignificant girl thrown out with the rest of the garbage. Alita: You are a Hunter-Warrior. Dr. Dyson Ido: Stay here. Don’t kill anyone. Alita: [to Ido] You know more about me than you’re saying. Whose body is this? Who am I? Alita: This was your daughter. You built this body for her. Dr. Dyson Ido: Her name was Alita. She was really looking forward to waking up with legs that could run. Alita: You built her a pair of fast legs. Dr. Dyson Ido: She never got to use them. She was murdered. Dr. Dyson Ido: Her mother, Chiren, couldn’t deal with Alita’s death. Maybe she just couldn’t deal with me. So I went hunting. Dr. Dyson Ido: I needed to kill him. Maybe I was just hoping that he would kill me. It brought no peace. There were other demons like him out there, and I felt somehow I was responsible for all of them. So I registered as a Hunter-Warrior, there’s nothing noble about it. Alita: Did you ever find peace? Dr. Dyson Ido: I found you. Alita: I’m not your daughter. I don’t know what I am. Dr. Dyson Ido: I do. Dr. Dyson Ido: Have a look at your original cyber core. This your brain. A normal, healthy teenage girl’s brain. If there is such a thing. But this is your heart. Heart of your original core. Powered by an anti-matter micro reactor. Alita: So I’ve got a strong heart. Dr. Dyson Ido: You have a heart strong enough to power all of Iron City for years. This is lost technology. Nobody’s made this stuff since before The Fall. Alita: Yeah, right. So I’m three hundred years old? Dr. Dyson Ido: Sweetheart, you are. Alita: The woman in my memory, called me 99. Dr. Dyson Ido: What you saw is a flash of your previous life. Dr. Dyson Ido: In time you’ll remember. Alita: I want to be a Hunter-Warrior like you. Dr. Dyson Ido: Alita, that’s impossible. Alita: We could be a team. Dr. Dyson Ido: Alita, this is dangerous. It’s dirty work. Dr. Dyson Ido: No, you don’t. Alita: How is that your choice to make? Dr. Dyson Ido: It’s out of a question. Alita: I might need a life or death situation to remember who I was. Even if it’s just for a second. Dr. Dyson Ido: Alita, some things are better left forgotten. I don’t want blood on these hands too. Alita: Then I’ll find out for myself. Alita: I’m just tired of it. He just wants me to be his perfect little girl. Hugo: So are you going to live by his rules or yours? Kinuba: Vector, you prick! I should’ve known. Vector: What you should’ve known, my friend, is that no one is greater than the game. Alita: What’s outside the city? Hugo: Not much. The war wiped out all the utilities and most everything else. Hugo: All we know is Sky City fell all in one night, when the enemy launched the last attack with every ship they had. Alita: Who was the enemy? Koyomi: United Republic of Mars. URM. Hugo: On that last night of the war, there earth shook and the sky burned. And in the morning, Zalem stills stood. Alita: This body, it has the power I need. I feel a connection to it. I can’t explain. This could be who I am. Dr. Dyson Ido: You’ve been given a chance to start over, with a clean slate. How many of us get that chance? Alita: Why did an enemy warship respond to me? Because I knew that ship! I’ve been on others like it, haven’t I? Haven’t I? Dr. Dyson Ido: Whatever you were, is not who and you are now. Alita: No! I’m a warrior, aren’t I? And you know. You’ve always known. Dr. Dyson Ido: This is called a Berserker. It’s a humanoid weapon system created by the URM Technarchy. Your core was designed to interface with this type of body. Your identity code activated it. The instinctive fighting technique you use is Panzer Kunst. A lost combat art for machine bodies, it was used by the Berserkers. This is why you’re drawn to conflict without hesitation. It’s part of your training. You are not just a warrior, Alita. You an URM Berserker. The most advanced cyborg weapon ever created. And that is exactly why I will never unite you with this body. Alita: I heard you were the heroes of Iron City. I am not impressed. Hugo: What the hell are you doing? Alita: I’m going to need you to stand way back. Alita: I will take on anyone in this room. And if I win, you fight alongside me. Grewishka: I’m only here for the girl. Zapan: Well, she’s all yours. Dr. Dyson Ido: What about the rest of you? Master Clive Lee: There is no bounty on this guy, Doc. Not our problem. Grewishka: Aah. The only one with courage. So innocent. Grewishka: Iron City is no place for an innocent, little flea. Alita: [in her mind] I do not stand by in the presence of evil. Alita: I do not stand by in the presence of evil. Gelda: You have the soul of a survivor. They’ll never give up. Know what is hidden. Always ask what is it that you are not seeing. Gelda: He’s the dragon that must be slain. Alita: What’s the matter? My little toy doesn’t want to play anymore? I’ll turn you into a living pendant to adorn my chest. And then I can hear your voice every moment of the day, bleeding for mercy! Dr. Dyson Ido: Well, look at you. Dr. Dyson Ido: Well, you were right. A warrior’s spirit needs a warrior’s body. Dr. Dyson Ido: It draws in air, generating an arc plasma. Um, you control it, I don’t know. Didn’t exactly come with the manual, did you? Some kind of weapon. Dr. Dyson Ido: Now you know who you are. Dr. Dyson Ido: But that’s just a shell. It’s not bad or good. That part’s up to you. Alita: Does it bother you, that I’m not completely human? Hugo: You are the most human person I have ever met. Vector: She is the last of her kind. The finest weapon of the URM Technarchy. I need you to destroy this Alita. I need you to bring me her heart. Grewishka: I live only for her death. Vector: I like your drive, Hugo. You have a solid future with my team. Hugo: My future is in Zalem. I remember your promise everyday, to send me up when I get you a million credits. Vector: Personally, I’d rather rule in hell than serve in heaven. To be at the bottom of the food chain up there. But down here, we could live like kings. So tell me about this friend of yours. Vector: Is that her name? Alita. Alita: I was hoping maybe you’d want to stay. Hugo: Hey. It’s not right away. I still got to raise the rest of the money first. Alita: It’s okay. It’s your dream. I know it’s what you’ve always wanted. Hugo: You know, I was always so sure. And you came along, nothing is clear anymore. Alita: How much more do you need before you can go? Alita: Ninety K? I can make that in bounties. I’ll just figure out who has the highest prices on their heads and then I’ll take them out. Hugo: No, I can’t ask you to do that for me. Alita: I’d do whatever I had to for you. I’d give you whatever I have. Hugo: What are you doing? Alita: I’d give you my heart. Take it. It’s got an URM micro reactor for power supply probably worth millions. With your connection you can find a buyer. You can make enough for both of us to go to Zalem, and then we’ll just find a cheaper replacement. Alita: Come on, you buy and sell parts all day long. Hugo: Don’t just do things for people. No matter how good you think they are, or how deserving they are. Alita: It’s all or nothing with me. This is who I am. Hugo: I know. It’s okay. Put it back. Alita: That was pretty intense, huh? Hugo: Yeah, that was very intense. Vector: You are the scum of the game. But tonight you’re hand-picked scum, because tonight is not a game. It is a hunt. I’m paying five hundred thousand to the one who kills the girl called Alita. Vector: You had her heart in your hands, and you let her live. Chiren: Because I’m a doctor. And I’m a mother. And somehow I forgot that. I can’t do this anymore. I’m out. Vector: Chiren, wait. Don’t you think it’s time you went to Zalem? I mean I could send you up there right now. Chiren: What I want isn’t up there. Vector: I’ve found the only way to enjoy immortality is to watch others die. Alita: You’ve just lost a puppet. Vector: Well.That looks fatal. No matter. The Vector was getting tiresome. Alita: You’ve made the biggest mistake of your life. Vector: Until next time. Remember, I see everything. Alita: You have to come down. We can’t stay up here. Hugo: There’s a bounty on me. This is the only way. Alita: No, this is dangerous! We have to get down now! Hugo: If I go back down there, I’m dead!! Alita: No, you have to listen to me, okay? I’ve been right here before. This is exactly where Nova wants you. He’s using you to get to me. Come on, we have to go back down. Hugo: We belong up there, Alita. Alita: We don’t belong anywhere, except together. Hugo: But we’ll always be running. Alita: Together. Come with me. Please. Alita: Hold on! I got you! Okay. Okay. Don’t move. Don’t move. I’m going to lift you up slowly. Hugo: Thank you, for saving me. What do you think of Alita: Battle Angel quotes? Let us know what you think in the comments below as we’d love to know. Awesome movie gonna make some tees and decals definitely! Alita battle angel has been the best movie of 2019, even though 2019 just started, and the best movie i have ever seen in my entire life!!!!! i will for sure go watch it over and over again!!!!! Love it, love it, love it, love it!!!!! Movie is sincerely worrh seeing. See this with your spouses. With your kids. It’s something else. I watched this movie with my wife. She was really surprised that she enjoyed this movie as much as she did. This is not a genre she normally would agree to see. I give it only a rating of 4 since the movie was very good in and of itself. The loss of 1 point was due To, in my opinion the most Lame ending I have seen in a long long time. In fact I thought it was so lame I nearly decided to only give it 1 point but that was not fair to the story line, action and overall good work and effort that went into this movie.